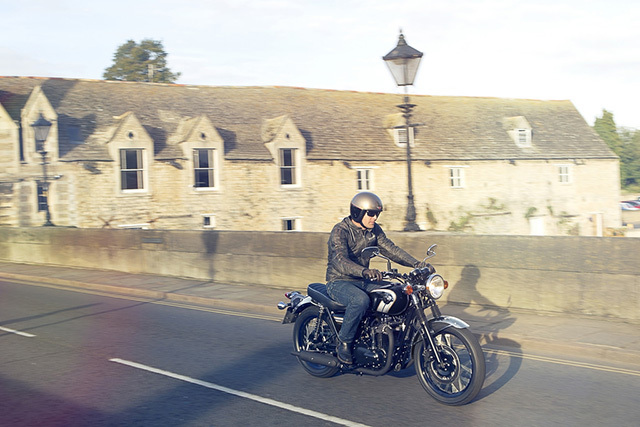 The W800 produces loads of feel-good pulse from the Vertical Twin engine displacing 773cm3. 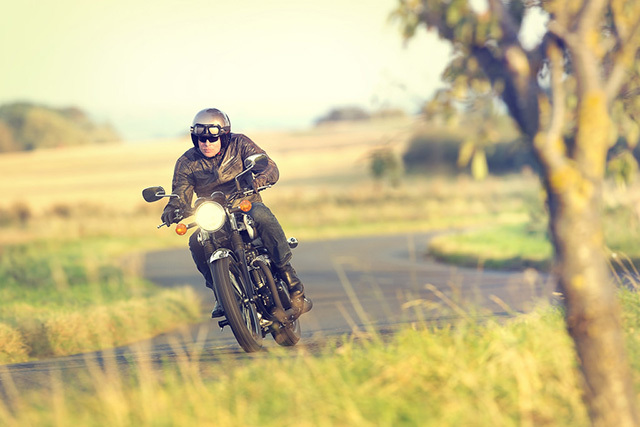 The strong low-mid range torgue enhances the unhurried pleasure of the vintage ride. Black engine parts - Contrast and compare. 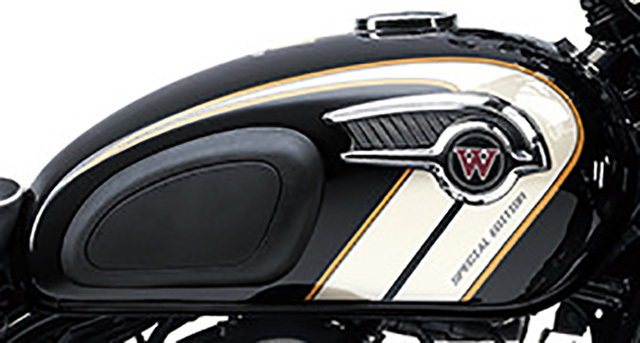 The W800 Special Edition shines thanks to an air-cooled black vertical twin engine and clever highlights. 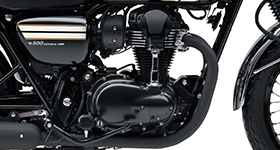 Iconic bevel-gear-driven cam adds classic beauty to the engine. 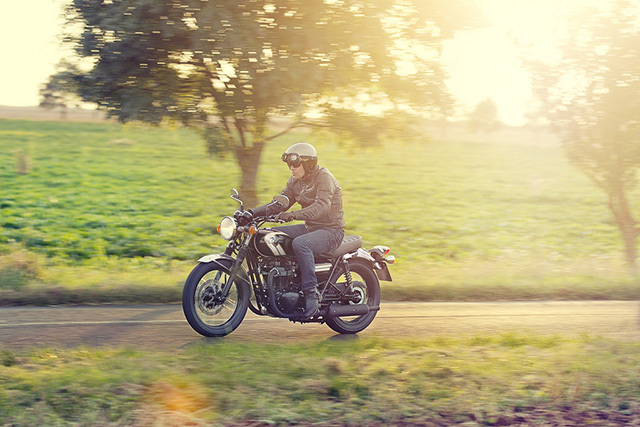 Electronic Fuel Injection - The W800 features a fuel injection system that does not take away from the vintage look of the motorcycle. 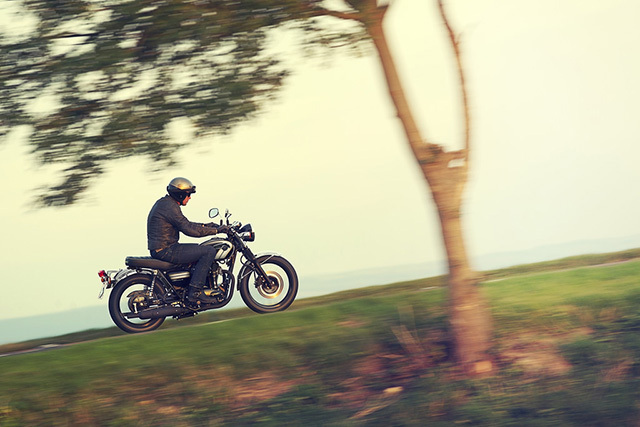 It also provides reliability, precise fuel metering, clean emissions and easy starting. The 19" front and 18" rear wheels add to the classic appearance of the W800. The 19" front provides that classic handling feel with a fine balance of relaxed, light turning and straight line stability. 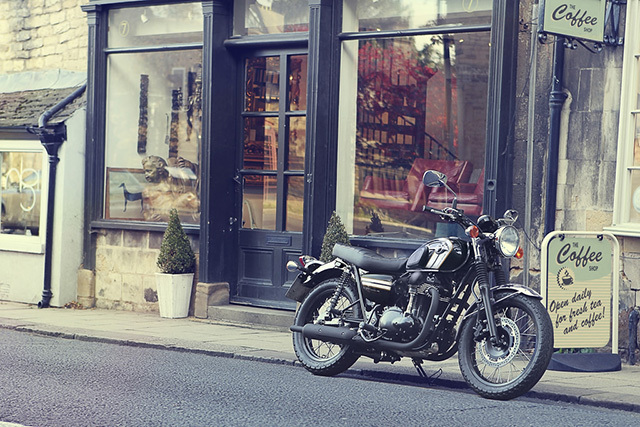 Easy to read, informative and the ultimate blend of heritage charm with modern riding requirements. The look of love. Every time you look down you can see the unique Kawasaki Special Edition logo. The right feel and fit is added to with the W800 knee pads are standard on the bike. The W800's deeply padded seat features classic ribbed padding and colour matched wire piping for a custom look straight from the factory. 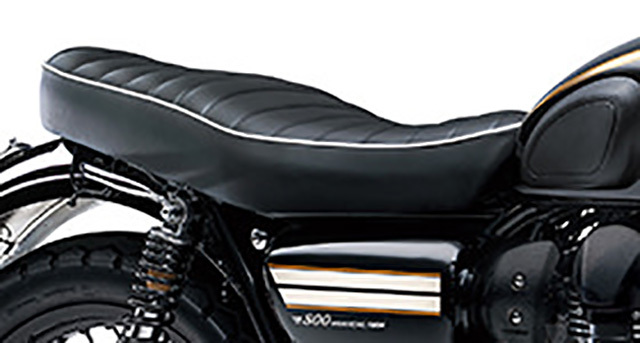 Long, comfortable seat with thick, ribbed padding has plenty of room for rider and passenger. Urethane at the front of the seat was shaped to facilitate the reach to the ground. 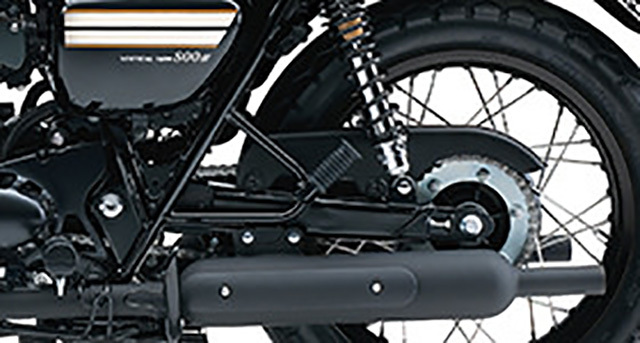 The black chrome finished passenger grips add a quality touch. 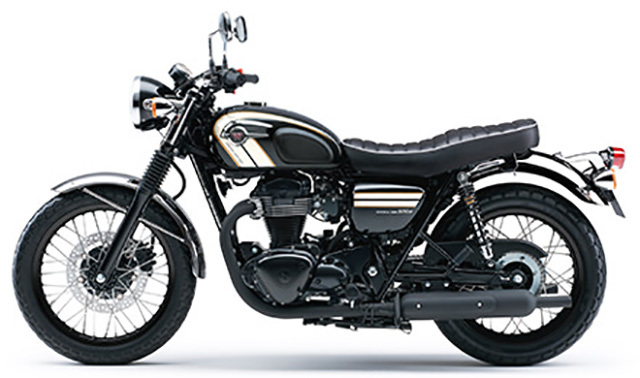 Small details like the steel chain guard, elegant muffler design, sculpted fuel tank and steel fenders all help give the W800 its stunning vintage look. 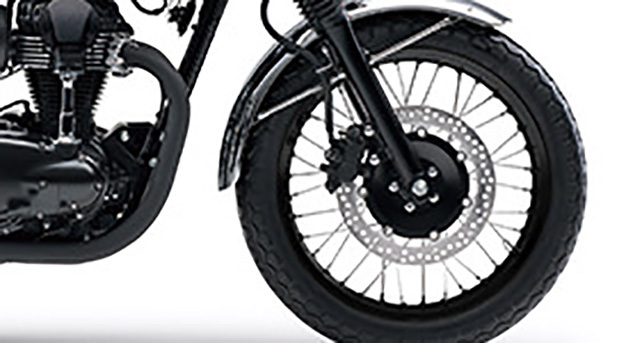 The centre stand is a standard item on the W800. Metal parts have been used in favour of plastic throughout the W800. Corrosion-resistant parts have been selected to maintain its long term charm. 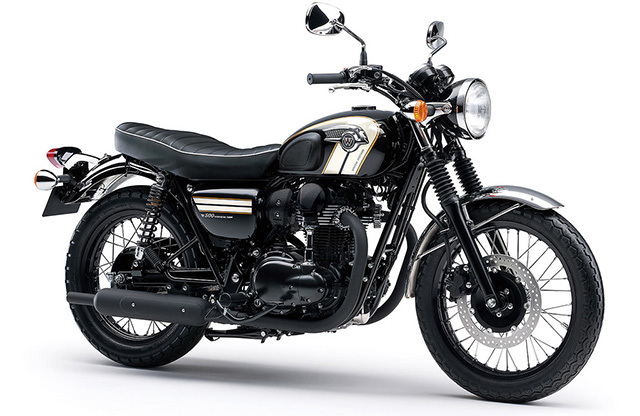 The W800 Special Edition is the latest model in a brand that spans over 50 years with Kawasaki's original W1 debuting in 1966. It was the largest displacement Japanese model of its time. The W800 owes its pedigree to a long line of predecessors such as the 1968 W2SSE shown here.